What's the Difference Between Buzzards and Vultures? Can You Tell These Birds Apart? Buzzards and vultures may seem like common, familiar birds, but these two terms can actually be very confusing and are often mistaken for completely different species. So, what’s the difference between buzzards and vultures, and how can birders avoid these confusing errors? Vultures are universally understood to be the bald-headed, long-necked scavenging birds that get a bad reputation for their enjoyment of eating carrion. These birds actually provide a valuable ecological service, however, as they clean up carcasses and help prevent the spread of diseases to other wildlife. There are 23 vulture species in the world, in two distinct groups. The seven vulture species of the New World belong to the Cathartidae bird family, while the 16 vulture species of the Old World are in the family Accipitridae. Despite the fact that these species are only distantly related, however, they do share many familiar characteristics and both groups are easily recognized as vultures. There are 26 bird species in the world named buzzard, including the European honey-buzzard, lizard buzzard, forest buzzard, and long-legged buzzard. At least one buzzard species can be found on every continent except Antarctica. Buzzards are a type of hawk, specifically, buteos. These are medium- to large-sized hawks with broad wings ideal for soaring on thermal currents. Most buzzards prefer relatively open country where they can soar easily and search for prey. Unlike vultures, buzzards hunt for their meals and prefer to capture living prey, though they will occasionally snack on a carcass, especially if other food sources are scarce. While these birds are called buzzards in Europe, Africa, Asia, Indonesia, and Australia, the exact same types of birds, open-country buteos, are called hawks in much of North and South America. The familiar red-tailed hawk, for example, would likely be called a red-tailed buzzard if it were found in Europe. Even in field guides, the rough-legged buzzard (Buteo lagopus) is called the rough-legged hawk in its North American range. Where vultures and buzzards get confusing is when the casual names of these birds overlap. While buzzards and vultures are distinctly named and separated in Europe, Africa, and Asia, some birds go by both names in North America. When European settlers first colonized New England and other parts of North America, they gave familiar names to unfamiliar birds in an effort to remind themselves of home. This is how the American robin got its name, as its orange-red breast is similar to the coloration of the European robin, even though the two birds are not closely related. 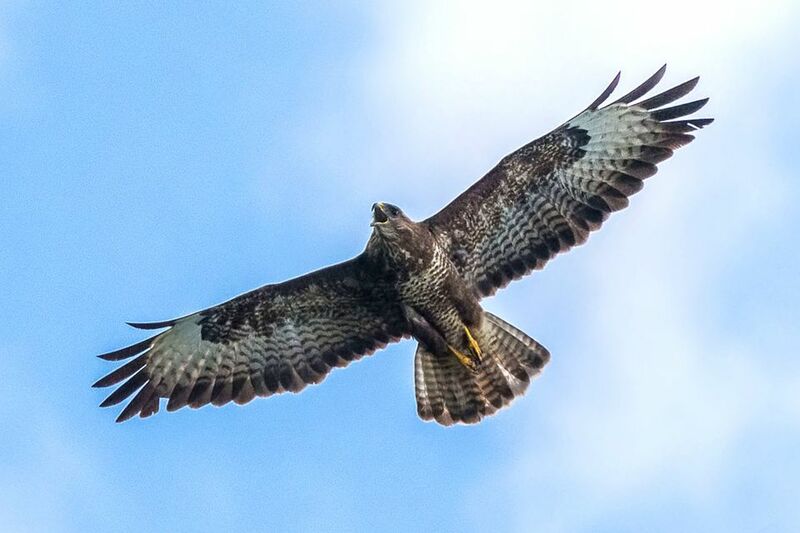 Early colonists called the large, soaring birds they noticed in North American skies “buzzards” because they looked similar to the flight patterns of the buzzards in Europe. The birds those colonists were really seeing, however, were not buteo hawks, but were turkey vultures and black vultures, which are widespread in eastern North America. The name stuck, and even today the North American vultures may still be commonly called buzzards, turkey buzzards, or black buzzards. Buzzards vs Vultures – Who’s Who? This name confusion is why it is important for birders to learn the scientific names of birds, especially when they are birding in different parts of the world. Using scientific names ensures there is no confusion about which bird is which, particularly for research, listing, or reporting sightings. Ornithologists and wildlife officials, in particular, will use scientific names in their reports to be sure it is absolutely clear and unmistakable which birds they are referring to. Understanding the differences between buzzards and vultures, including how different words may refer to the same birds, can help birders better communicate which birds they see and share their sightings with others. Do You Know the Different Seabirds?